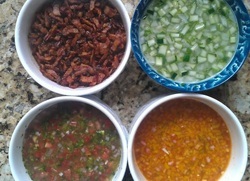 Add the liquid ingredients and seasonings to a bowl and mix. Add the chopped veggies and stir. Create variations by using tomato, peach, or mango in place of or in addition to cucumbers. Or, add hot chilli peppers. 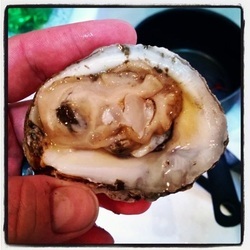 Use as a topping for seafood, chicken, or pork. Or, as a dip for chips or pita bread. Dash El Guapo Cucumber Lavender Bitters onto freshly shucked oysters. 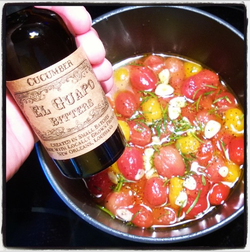 Other great bitters to use in this way are El Guapo's Fuego, Mojo Cubano, Gumbo, or Crawfish Boil Bitters. If you have access to sushi grade fish, then slice it thin and eat it raw. A salt block is a great way to enjoy fish in this manner. 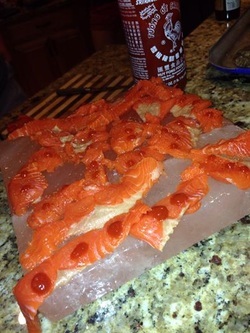 Slice fish thin, lay on the block, dash on the bitters and a little hot sauce. Bitters can also be used on cooked fish. Dash a little on before cooking to ensure flavour penetration. Then dash on a little more after cooking to restore moisture and add a fresh layer of flavour. Bring a pot of water to boil with a pinch of salt. Drop the tomatoes into the water for 1 minute. Remove from boiling water and place into an ice bath (water and ice) to shock and cool them. Carefully peel each tomato and place into a small pot. Add olive oil, bitters, garlic, rosemary (strip leaves from stem into pot). Serve on sliced & toasted rustic bread and spread with soft chevre (goat cheese).